Introduction: – In this article, we are going to know about some other new features of Oracle 12c. Unified Auditing is a new feature in Oracle 12c. In Oracle 12c, a new database auditing Foundation has been introduced. Oracle Unified Auditing changes the fundamental auditing functionality of the database. In previous releases of Oracle, there were separate audit trails for each individual component. Unified Auditing consolidates all auditing into a single repository and view. This provides a two-fold simplification: audit data can now be found in a single location, and all audit data is in a single format. In version, 12c came on the scene a new architecture for auditing the Oracle database, Unified Auditing. Until then we had 3 audit methods in the database: Fine Grained Auditing (FGA), Value Based Auditing (Audit with triggers) and Standard Database Auditing (AUDIT command). 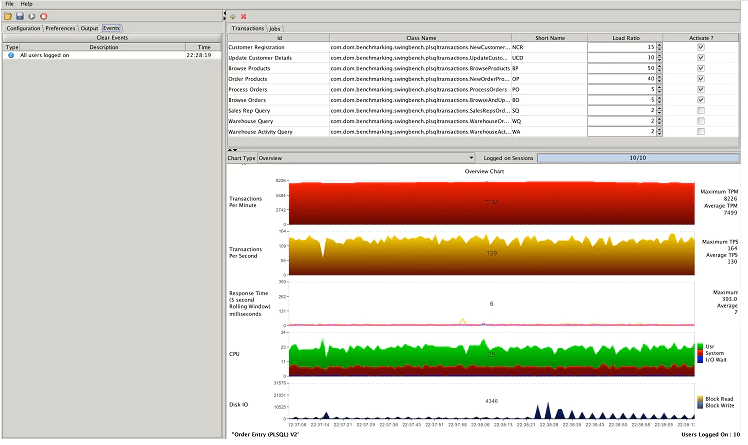 Auditing in Oracle has always been related to a large loss of performance due to recursive operations. With Unified Auditing there is a memory area where information is written first, it basically has the same concept as the redo log buffer, it first writes to memory (unified_audit_sga_queue_size) and then to disk in the tables of the new AUDSYS schema. The remaining audit methods can still be used and remain stored in the SYS schema in the AUD $ and FGA_LOG $ tables. Two new roles separate auditing roles: AUDIT_ADMIN for configuration and administration and AUDIT_VIEWER for viewing and analyzing audited data. Most DBAs hate auditing and the reasons are reasonable: it’s annoying to set up, it impacts the performance of the environment, it’s not as secure until 12c because the audit data stays in the SYS schema and we have no other choice. Unified Auditing is actually safer because a new schema called AUDSYS stores auditing data is more performative because of the memory area allocated for this purpose and replaces almost all existing audit methods. That alone is a good reason to upgrade to 12c, but that’s not the focus of this article. Deter users (or others, such as intruders) from inappropriate actions based on their accountability. Investigate suspicious activity. For example, if a user is deleting data from tables, then a security administrator can audit all connections to the database and all successful and unsuccessful deletions of rows from all tables in the database. Notify an auditor of the actions of an unauthorized user. For example, an unauthorized user could be changing or deleting data, or the user has more privileges than expected, which can lead to reassessing user authorizations. Monitor and gather data about specific database activities. For example, the database administrator can gather statistics about which tables are being updated, how many logical I/Os are performed, or how many concurrent users connect at peak times. Detect problems with an authorization or access control implementation. For example, you can create audit policies that you expect will never generate an audit record because the data is protected in other ways. However, if these policies generate audit records, then you will know the other security controls are not properly implemented. With Unified Auditing, as the name says, Unified Audit, audit logs are queried in one place, in a single view called UNIFIED_AUDIT_TRAIL. SQL * Loader Direct Load. Mixed Mode: option enabled by default. All audit features work as before version 12c, but new features are also available. Audit data can be queried either in views such as DBA_AUDIT_TRAIL or DBA_FGA_AUDIT_TRAIL, already known up to this version and in the new UNIFIED_AUDIT_TRAIL. When SYS auditing is enabled, the logs are still written to the directory configured through the AUDIT_FILE_DEST parameter. Pure Mode: must be enabled by doing a relink of the kernel and for that the database and other components must be stopped. Once Pure is enabled, or Full Mode is also called, all audit configurations prior to version 12c are ignored and the audited data is stored using Oracle SecureFiles. All audit data is found by referring to the UNIFIED_AUDIT_TRAIL view. We found that it is not enabled because the value returned was FALSE. This means that we are using Mixed Mode, so now let’s enable it to use Pure Mode. As previously mentioned we have to recompile the Oracle Kernel and for this, we have to stop all Oracle components. In this example, the database is on a Standalone Server with Grid Infrastructure 12c. Service "+ ASM" has 1 instance (s). Service "loredb.localdomain" has 1 instance (s). Service "mypdb.localdomain" has 1 instance (s). [Oracle @ loredata-srv ~] $ srvctl stop database -db loredb [Oracle @ loredata-srv ~] $ srvctl status database -db loredb The database is not running. The database is not running. There is no need to stop the ASM instance, as it is another binary, another ORACLE_HOME. Many policies can be created in the database, but it is best to limit the number of policies enabled. • Few policies make it easy for Oracle’s internal check to know where the audit trail will be written. If you are not already familiar with Pluggable Databases, you can already practice this example. Let’s now create another user to select the data from the TEST table. In the other session, connect to the newly created JOHN user and see the data in the TEST table. Return to the SYS session and consult UNIFIED_AUDIT_TRAIL to see if the audit took effect. ORA-46361: Audit policy can not be dropped as it is currently enabled. We can see that few records have been removed, this is due to the use of the USE_LAST_ARCH_TIMESTAMP option as TRUE, which guarantees the records saved after the last filing. DBMS_AUDIT_MGMT.GET_LAST_ARCHIVE_TIMESTAMP function for read-only databases. The default value is TRUE. Oracle recommends that you set USE_LAST_ARCH_TIMESTAMP to TRUE. • FALSE deletes all audit records without considering last archive timestamp. Be careful about using this setting, in case you inadvertently delete audit records that should have been deleted. When we use Standard Auditing, audit records are written directly to the AUD $ and FGA_LOG $ tables. For this reason, an audit has always been related to performance loss in Oracle, but in version, 12c Oracle Database uses an area of SGA memory where records are temporarily stored in a sort of queue and when this area is full the flush occurs, For the tables through the GEN0 process. It is an architecture similar to the log buffer. In this new architecture exists the possibility of loss of registers in case of the fall of the instance, because there may be records in memory that were not downloaded to the tables. If auditing is more important than performance then we can use Unified Auditing with immediate recording and this way we will not lose. I used Swingbench to demonstrate the performance of audit methods. 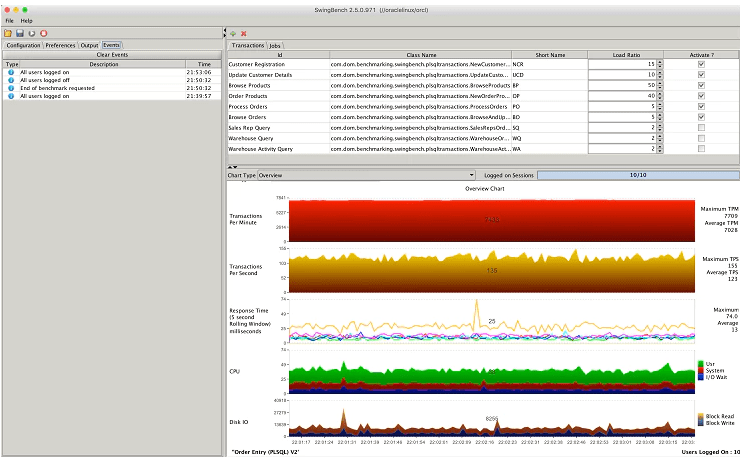 Figure 1 – 10 users, average 7153 TPM, average response time 11ms. Figure 2 – 10 users, average 7028 TPM, average response time 13ms. Figure 3 – 10 users, average of 7499 TPM, average response time 7ms. 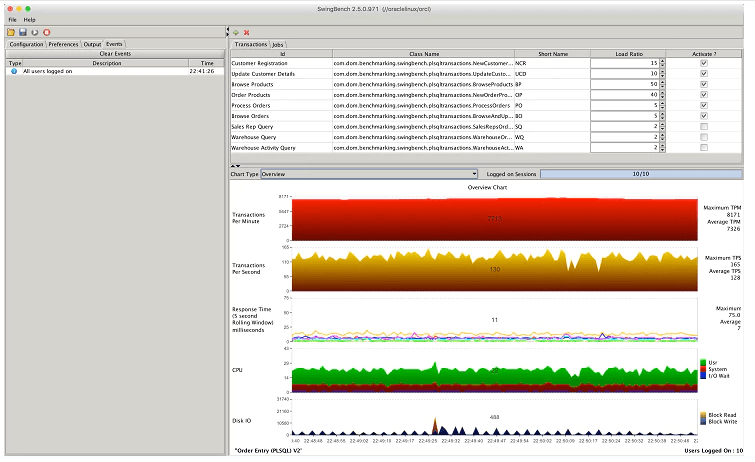 Figure 4 – 10 users, average of 7326 TMP, average response time 7ms. Swingbench was used with all standard parameters and 10 users logged into the same database and under the same conditions for about 10 minutes where I took the average transaction for the period. After each run I logged out and logged in again through the tool. Oracle Database 12c has several new features, we have seen one of them being Unified Auditing. We learned that we can create auditing policies to audit what we think necessary without harming the performance of the database and also look at that data in a view that centralizes everything. We can still audit the same operations as in versions prior to 12c, but now with more benefits. During the tests it was not possible to accurately verify the performance gain, since the environment was not overloaded and the competition of users was low, but nevertheless it was possible to identify a good gain compared to the architecture before version 12c.